Sora and Shiro have managed to back the Eastern Union into a corner by challenging them to a battle, but in the face of the overwhelming physical ability of the Werebeasts, they have much work to do to prepare. Unfortunately, just as they begin to get ready Sora goes missing! Anyone looking for a unique take on a classic-seeming fantasy world will be fascinated by the setting. If you are looking for clever mind games where the protagonist faces seemingly insurmountable odds, then this is the book for you. 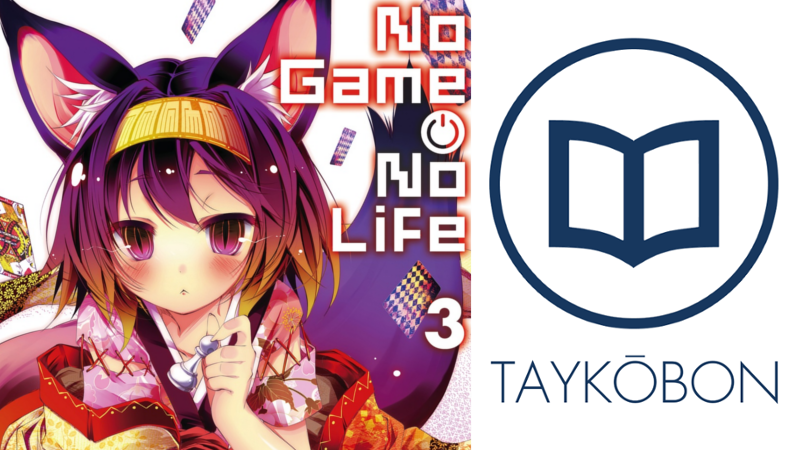 No Game No Life has always been a clever series, but as more-or-less the end of an arc, volume three is by far the most clever and engrossing, as well as the most substantial volume. While much like the other books there was a major game to be played in the second half, the setup for the game in the first half was an almost equally compelling challenge and added a bit of balance to the book that was most definitely not an unwelcome addition. In the very beginning, Shiro wakes up to discover that not only is Sora missing, but supposedly he doesn’t exist. Her struggle to find out what happened is punctuated by occasional moments of thoughts from Sora that are written in backwards order from when they chronologically occurred in the game that caused the predicament. This method of storytelling is another testament to Kamiya’s already proven ability to come up with and write in decidedly unique ways, and was a very entertaining setup for the game Sora plays in an attempt to win Chlammy and her elf friend Fi over to his side. However, the real strength of the book came from the final battle, the much anticipated face-off between Elkia and the Eastern Union. The actual fight between Izuna and the gamer siblings is both intense and interesting as physical strength bordering the impossible faces intelligence and wit of equal proportions. Sora and Shiro’s exploitation of the game’s mechanics in order to beat Izuna is nothing if not convoluted. That being said, what I find most interesting about No Game No Life is how it takes competitions and comes up with insane solutions that are literally impossible for the readers to be able to predict before they occur. Normally, this would be deus ex machina (a trope that is 99% of the time just poor writing), but instead Kamiya goes on to thoroughly explain the cleverness of the characters’ strategy that makes for constant fascination. What was also especially interesting in this third volume was how heavily everything Shiro and Sora do plays such an important role in their overall strategy, from Sora going missing in the beginning to Stephanie and Jibril’s unwitting roles in the game against the Eastern Union. It makes the entire book an experience of coming up with outrageous theories only to find them somehow thwarted by Kamiya. Aside from trolling the readers, Kamiya’s writing always seems to have an amusing flair to it that continues in this volume both in his descriptions and his use of new characters from the Eastern Union and how they interact with the gamer siblings. Although the series still maintains the sleaziness of previous volumes, at this point if you are still reading it shouldn’t be much of a problem as it doesn’t get worse. As for the translation issues that I mentioned last time, many of the clunky-sounding bits of English still perpetuate in this one as well, but it is worth noting that Kamiya’s interesting style is still evident through this. No Game No Life manages to be at its most entertaining level yet in its third volume. The thrill of the chase, more or less, in reading about Sora and Shiro’s duel with the Eastern Union is riveting and surprising, and maintains the same charm from previous iterations. If you are a fan of the series, this book is a must-read. No Game No Life Vol. 3 was published in English by Yen Press on October 27st, 2015. Authored by Yuu Kamiya, the series is ongoing in Media Factory’s MF Bunko J imprint. The series also received a one-cour anime adaption by Madhouse in Spring 2014 and volume 4 is listed to be published in English on March 22nd, 2015. The series recently returned from a 1-year break with the release of volume 7 in Japanese this summer. Follow us on Twitter here for all the latest updates!